Defense contracting; and points of marketing contact. Navy market. Market opportunities are identified, market- ing actions are suggested. Forms used to enter the Navy- market and backup details are included in five appendices. Value $380. • "U.S. NAVY SHIP OVERHAUL MARKET"—another invalu able Navy sales tool also published by International Mari- time Associates, Inc. (IMA). This is a marketing guide to the $-multi-billion Navy ship repair and alteration program. Seven sections totalling 175 pages of invaluable Navy sales information. FOR SUBSCRIPTIONS RECEIVED BEFORE MARCH 25, 1985. 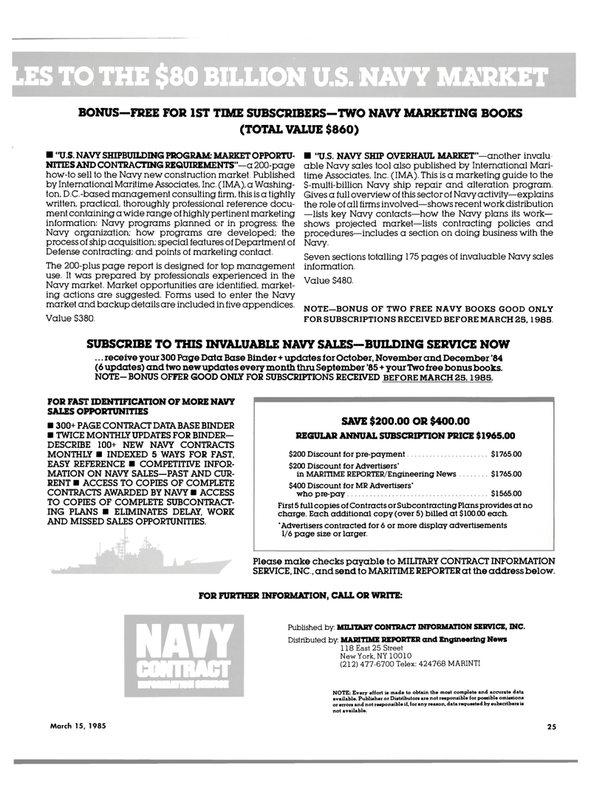 SUBSCRIBE TO THIS INVALUABLE NAVY SALES—BUILDING SERVICE NOW ... receive your 300 Page Data Base Binder + updates tor October, November and December '84 (6 updates) and two newupdates every month thru September '85 + your Two free bonus books. NOTE- BONUS OFFER GOOD ONLY FOR SUBSCRIPTIONS RECEIVED BEFORE MARCH 25,1985. First 5 full copies of Contracts or Subcontracting Plans provides at no charge. Each additional copy (over 5) billed at $100.00 each. "Advertisers contracted for 6 or more display advertisements 1/6 page size or larger. SERVICE, INC., and send to MARITIME REPORTER at the address below. Published by MILITARY CONTRACT INFORMATION SERVICE, INC. NOTE: Every effort is made to obtain the most complete and accurate data available. Publisher or Distributors are not responsible for possible omissions or errors and not responsible if, for any reason, data requested by subscribers is not available.